First it was Metallica getting ticked off that fans were stealing their material. 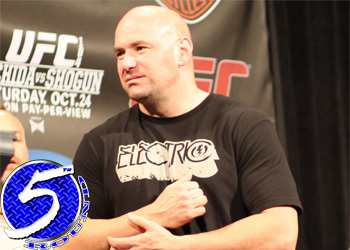 Now, UFC president Dana White has taken over the “Stop Jackin’ My Stuff” campaign. The world’s premier MMA organization announced they reached confidential settlements with over 500 businesses and individuals as a result of illegal broadcasts and views of their shows. The settlements are only part of the UFC’s campaign to combat piracy, which includes working closely with federal and state law enforcement agencies. The UFC appears to be tearing a page right out of Metallica’s playbook. The popular rock group took a similar stance in the late 1990’s when fans were illegally swapping their music on the web, courtesy of Napster (remember them?). That was a long and drawn-out process, however the music exchange community that was Napster was ultimately laid to rest. However, that was nearly a decade ago and people are still getting music for the everyday low price of $Free.99. However, the UFC is right. If we want this sport to grow, which we all do, we have to support it. Pay for the pay-per-views people, otherwise Dana’s comin’ after you!